A photo of a Jimmy Dean sausage package under recall. 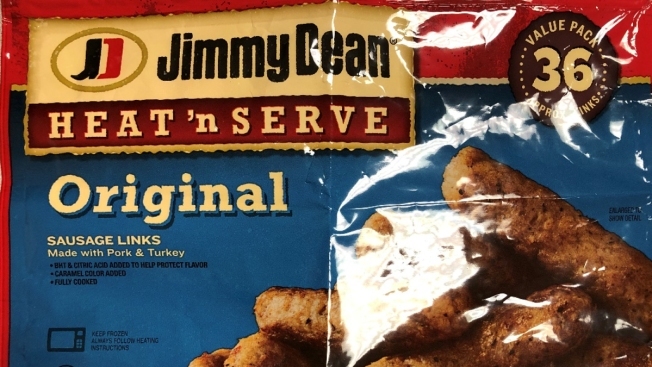 Attention Jimmy Dean sausage lovers: check your freezer because your links might be under recall due to possible metal contamination. Kentucky-based CTI Foods LLC has recalled more than 29,000 pounds of frozen, ready-to-eat pork and poultry products that may be contaminated with metal pieces, the U.S. Department of Agriculture’s Food Safety and Inspection Service (FSIS) said on Monday. There haven't been any reports of "adverse reactions" thus far, but the government still classified the recall as a high health risk, defined as a "reasonable probability that the use of the product will cause serious, adverse health consequences or death." The government was notified on Dec. 10 of five complaints of metal pieces found in the sausages. Jimmy Dean said in a separate release about the voluntary recall that the consumers who complained had spotted small, string-like fragments of metal in the product. About 2,845 cases of the product were made at one plant location on Aug. 4. It's not immediately clear which retailers sold the potentially contaminated sausages. But Jimmy Dean said the product was sent from a Tennessee distribution center to 21 states: Arizona, California, Connecticut, Florida, Georgia, Iowa, Idaho, Illinois, Kansas, Minnesota, Missouri, North Dakota, Nebraska, New York, Ohio, Oregon, Pennsylvania, Texas, Virginia, Washington and Wisconsin. Jimmy Dean spokesman Worth Sparkman said "there's always a little post investigation" and that the FSIS would eventually publish the list of retailers. A USDA spokeswoman confirmed that list will be posted on the FSIS website here when available. Sparkman noted CTI Foods "wanted to get the news out" on the recall so that anybody who might have the product can look for it in their fridge and discard it. Consumers should throw away the affected sausages or return them to the store where they were purchased. Those with questions can call the Jimmy Dean customer service line at (855) 382-3101. The toll-free USDA Meat and Poultry Hotline 1-888-MPHotline (1-888-674-6854) is available in English and Spanish from 10 a.m. to 6 p.m. ET on weekdays.